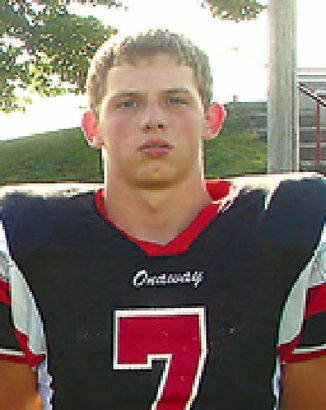 Onaway junior Matthew Tollini turned heads at Thirlby Field with his 4.5-second 40-yard speed. It was football weather in May at the second-annual Lake Michigan Football Report Exposure Camp at Traverse City’s Thirlby Field. Given that the majority of the players participating were from Northern Michigan, they shrugged off the cold and performed well for the college coaches and scouts in attendance. The camp’s biggest breakthrough was Matthew Tollini. He came in as a 6-0, 170 junior from Onaway, where he was an All-Ski Valley QB. He left the camp his starred and circled in the notebooks of the college coaches, who had requested to see him work out with the defensive backs after he ripped off the quickest 40 of the event, 4.51 seconds. He plays linebacker in the fall, and had nearly 10 tackles a game in 2012. With his size and athleticism looked at home with the switch and the defensive backfield looks like Tollini’s likely college destination. Danil Young is putting together quite a resume as only a sophomore. Starting in the O-K Red as an underclassman is impressive in itself. Now Young, a 5-10, 168 DB/QB, has backed it up with his post-season play, at two Lake Michigan Football Report events as well as the US Army National Combine. His pro agility time of 4.13 seconds was the second-fastest in TC, quick twitch and loose hips that also showed themselves in drills to turn and cover, as well as change direction and close quickly on the ball. He ran a 4.7 40, which he’ll need to shave down some as Young projects as a cornerback. But as an actual football player, he has the technique for the position and is willing to get his nose dirty as a tackler, which you don’t always see from a young cornerback. Another West Michigan kid who made the trek North after playing well at the GR even in March was Wyatt Batdorff, a 5-10, 176 defensive back from Forest Hills Northern. He performed across the board with a 4.6 40 (and was fast indoors at our March event), 4.26 pro agility and 10 reps at 185 lbs. He made good reads in coverage. Smart tackler going low efficiently instead of looking for highlight hits (and whiffs). GLIAC target. While recruiting aficionados will recognize Plainwell for sending linemen to the Big 10 the past two seasons. But the football renaissance there is widespread, and includes talent like 6-0, 170 junior Graham Hubbell, who ran a 4.65 40. No stranger to Thirlby Field, having played there against Traverse City Central and West, Cadillac junior QB Jalen Brooks said it was much more fun out there when you’re not being chased by Nate Pupel or Derrick Diver. Brooks is the top athlete in Northern Michigan, recruited by the MAC and GLIAC for football and GLIAC for basketball (the morning after the combine, he was playing in an AAU hoops tournament in Holland). The bigger schools envision him as a defensive back or possibly receiver. He showed here why he has a chance at quarterback, a 6-3, 190 dual threat. Brooks had maybe two balls get away from him all night, but otherwise was right on which can be hard working with receivers you don’t know. In the testing, Brooks ran the fastest 40 (4.61) and pro agility (4.31) of the QB entries, and the most bench reps (10). He’s an intriguing quarterback prospect given all the natural tools, with polish and college coaching there’s a high ceiling here. The camp’s top ‘traditional’ QB was Eric Potter, a Holt junior who looked bigger than his listed 6-0, 180. He threw a tight, very catch-able ball. Potter did a good job adjusting to various speeds and routes of receivers on the fly, his passes on the money regardless. He ran 4.9s, and is more smooth and poised in the pocket, escapability rather than explosive runs outside the pocket. Executed whether rolling out left or right. Chad Samuels is a 6-0, 170 junior QB from Reed City. He was solid at the March combine in Grand Rapids, and even better here. He threw it well on the move. Elk Rapids’ Adam Trautman looks the part as a 6-3, 175 sophomore (and off the field, with a 3.9 gpa). Apparently those classroom smarts apply to the filed, as last season he threw for 12 TDs to 1 INT, an impressive ratio particularly for an underclassman. The flipside of that is a couple times at camp Trautman aimed his throws instead of letting it flow and rip. His pro agility of 4.4 seconds was strong for a lanky, long-strider. The quarterback class for 2015 is shaping up quite strong in the Lake Michigan area, and Trautman is right in the mix. Will Noble is a 6-3, 185 junior with sub-5.0 speed from Kalkaska. His final destination may be the defensive backfield. The fastest receiver in the camp was Antonieo McMillian, a junior slot/returner type from Montrose at 5-8, 135. He ran a 4.53-second 40. In drills he caught the ball away from his body, on a cold night where a number of receivers struggled catching the ball. Traverse City West freshman Logan Pawloski made a good target at 6-0, 180, and muscled for catches with good hands and timing against quicker defenders. A small-school underclassman really intrigues. James Connolly was a standout running back last fall as a Brethren sophomore, with 100-yard games both running and catching the ball. He worked out here as a 6-2, 185 receiver.